For as long as I can remember, grade inflation has been one of the hot topics in undergraduate programs. And for good reason: "On average, grade-point averages are rising at a rate of about 0.15 points every decade," says Stuart Rojstaczer in his 2003 article "Where All Grades Are Above Average." "At this rate, everybody on campus will be getting all A's before mid-century." 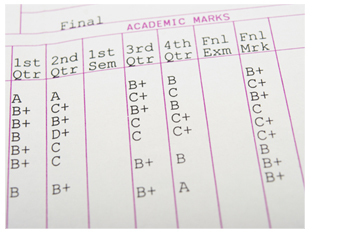 In theory, the upward trajectory of GPAs degrades the meaning of an individual grade. Does an A really signify superior work or is it simply the norm? If a student gets a B in the same course--a grade that used to be perfectly acceptable--has he or she done something wrong? The trend concerns professors as well, who believe that easy A's make some students less motivated. Clearly the trend has a negative impact on the state of undergraduate academia, despite the fact that, for the most part, it makes students feel happy and successful. But what about grade deflation? Though it may seem like there is no stopping the swift upward trajectory of the average undergraduate GPA, a few top-tier schools have managed to both make and sustain efforts to put an end to the easy A. In 2004, for example, Princeton University voted to redefine its grading policy, effectively curving students' grades suddenly downward. Not surprisingly, endeavors like Princeton's have been met with stiff resistance from those most affected: the students. Undergrads at these institutions worry that, once the deluge of easy A's subsides, their postgraduate prospects will dry up too. This concern brings up a significant question: How does a deflated GPA affect graduate school admissions and job offers? Though representatives from all sectors will be the first to assure candidates that grades aren't everything, they do count--especially since your GPA is often one of the first things an employer or admissions officer will notice. But how much do they count? To what extent are employers and admissions officers aware of (or sensitive to) grade deflation? And if you are a graduate of a school that practices grade deflation, what can you do to improve your chances? First, I spoke with Carolyn C. Wise, a Princeton grad and the Senior Education Editor here at Vault, to learn more about graduate school prospects. Like everyone else, she assured me that grades definitely weren't the only factor. "Grad schools require a complete application with standardized scores, letters of recommendation and personal essays, as well as undergraduate transcripts for a reason," she told me. "They want to see a complete picture of the applicant." An MBA program, for instance, will be especially cognizant of your previous work experience; law schools will use your LSAT scores to get a better idea of what your grades mean in a comparative sense; and PhD programs, especially in the humanities, will heavily consider your writing sample and recommendations. It is also important to realize that graduate schools do not just look at your overall GPA. It's much more important that you did well in the classes that pertain to the program. It won't matter if you did well in your class on the Human Genome if you're applying for a German PhD program. And if you bombed that class but did well otherwise, it won't matter that much either. "Schools want to see progress," says Wise. If your GPA is low, there are ways to boost it even after you've graduated. "Take a class on a topic related to the degree you want to study. For example, if you want to pursue an MBA, take a stats or accounting class and get a good grade. This will show the admissions office that you're committed and capable of handling the business school workload." What's more, says Wise, "A graduate school admissions office will be more attune to grading practices at individual schools, and how those grades translate into performance as a graduate student, than, say, a business." Thus, an A from Princeton (or Reed or Harvey Mudd) might mean more to an admissions officer than an A from Brown, where, as of March 2009, A's made up two-thirds of all letter grades given. You can also cast your grades in a better light if they are accompanied by a stronger overall application. A student with a 3.6 average GPA and excellent essays may well be given more consideration than a student with a 3.9 whose essays reflect a lack of maturity or intellectual curiosity. Finally, there is a sense in which grade deflation doesn't matter at all. Graduate programs are very aware of the class that they're creating, and admissions officers will try to keep in mind the number of students they are accepting from any given school. Admissions officers are therefore more likely to compare your application against others from your alma mater. And since you're being considered alongside other students who were held to the same standards you were, the effect of grade deflation (or inflation) can be a much smaller deal than you'd think. Unfortunately, things can get a little trickier when it comes to the job search. Connie Thanasoulis-Cerrachio, Co-founder of SixFigureStart and esteemed Vault.com blogger, was kind enough to help answer some of my questions on that front. While grades are not the be-all end-all of getting your dream job, says Thanasoulis-Cerrachio, good ones will help you get past "the gatekeeper"--or the person who decides whether or not it is worth the company's time to have you come in for an interview. In most cases, one of the first things that a gatekeeper will look at is whether or not your GPA meets their standards. Your best chance of getting an informed hearing for your GPA is from the on-campus recruiters from your university. Many companies will target around 15 schools using "school teams" composed primarily of alumni. It is the school team's job to get to know the college or university (and their grading policy) and to recruit prospective applicants. A member of your school's team can therefore sometimes act as the gatekeeper. Most often, however, the school team will simply forward your application along to the human resources department. Sadly, most HR gatekeepers won't necessarily have a concept of how difficult your undergraduate program was or how much hard work and intelligence your A's reflect. In an attempt to correct this lack of information, many of the schools who practice grade deflation send out a letter with each transcript explaining the policy and the affect it will have on your grades. Princeton, for instance, attaches a letter from the registrar explaining that a student's grades "reflect new institutional grading expectations...to address locally the persistent national problem of grade inflation." Yet, the likelihood that a potential employer will take the time to read and mentally process this letter in the midst of an onslaught of applications is unlikely at best. Of course, the minimum expected GPA for any given company is not set in stone. For instance, although consulting looks for GPAs of 3.7 and above at their target schools (and 3.8 and above elsewhere), they will often let a candidate with a lower GPA go on to the next round on the basis of an in-person meeting, excellent experience or a high-priority referral. Human resources and operations will look for a 3.3 or 3.2 and above respectively, but the same exceptions apply. In addition, just as with graduate school, other considerations are far more important. Your interview skills and your previous internships are key, as are good follow-up skills and persistence. Should a student who attended a school with grade deflation bring it up in an effort to explain their GPA? Thanasoulis-Cerrachio's answer, quite simply, was "no." Describing grade deflation, she explains, puts you in a negative posture--exactly the wrong place to be when you're trying to impress someone. Of course, if a recruiter does bring it up, you will need a smooth, 15 second sound-bite answer--but keep it short and simple. The most important thing is to stay positive and focus on why you would be the absolute best candidate for the position, grades aside. In the end, grades aren't everything and it doesn't seem to do a whole lot of good to focus on them if you've already graduated. In some sense, grade deflation can even be advantageous in that achieving the same GPA at a more rigorous institution can give you the advantage if the person reviewing your application is aware of your school's grading policies. But much more important are the other components of your application, which can in turn cast your GPA in a more favorable light. In other words, don't give up hope if you find your GPA deflated. You're still a smart, employable, loveable person, and you'll find a way to show it.